The stage is set for superstar quarterback Tim Tebow to deliver one of his clutch performances that will benefit young readers across the country. 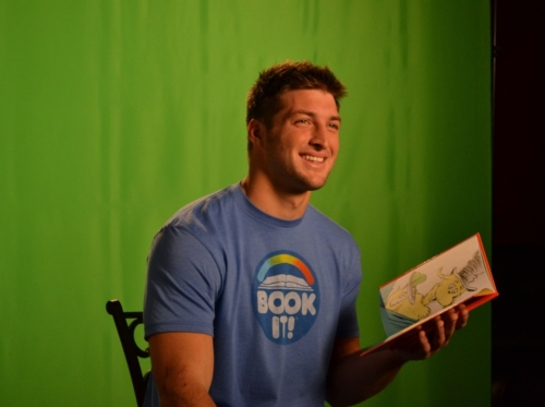 Tim has partnered with BOOK IT!, the reading incentive program sponsored by Pizza Hut, to host America’s Biggest Storytime, an annual celebrity webcast to motivate children to read more and to help develop a lifelong love of reading. Beginning today, Feb. 15 at 8 a.m. CST, Tim will read his favorite childhood book, “Green Eggs and Ham” by Dr. Seuss. Children, parents, teachers and sports fans alike are encouraged to join the webcast at bookitprogram.com/biggeststorytime. As a “thank you” for Tim’s participation, BOOK IT! has made a donation to the Tim Tebow Foundation, which is dedicated to bringing faith, hope and love to those needing a brighter day in their darkest hour of need. The 2012 webcast looks to surpass last year’s record setting event that recorded more than 500,000 viewers. Readers can join in by logging on to bookitprogram.com/biggeststorytime on Feb. 15 starting at 8 a.m. CST. The webcast will be available online through Feb. 22.